A difficulty with teaching kids programming in my CodeClub where they become lost ‘in the screen’. It’s a challenge (for any of us really but for children particularly) to disengage and think differently – e.g. to draw a diagram to work something out or work as part of a team. A problem with performing livecoding where a screen represents a spectacle, or even worse – a ‘school blackboard’ that as an audience we expect ourselves to have to understand. I’ve mentioned this recently to a few people and it seems to resonate, particularly in regard to a certain mismatch of children’s ability to manipulate physical objects against their fluid touchscreen usage. So, with my mind on the ‘pictures under glass’ rant and taking betablocker as a starting point (and weaving code as one additional project this might link with), I’m building some prototype hardware to provide the Raspberry Pi with a kind of external physical memory that could comprise symbols made from carved wood or 3D printed shapes – while still describing the behaviour of real software. I also want to avoid computer vision for a more understandable ‘pluggable’ approach with less slightly faulty ‘magic’ going on. Before getting too theoretical I wanted to build some stuff – a flexible prototype for figuring out what this sort of programming could be. 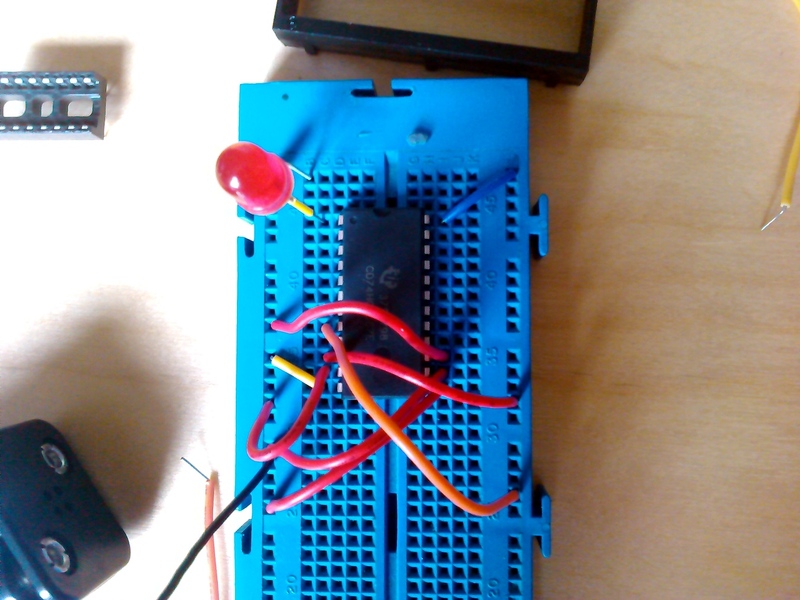 The Raspberry Pi has 17 configurable I/O pins on it’s GPIO interface, so I can use 5 of them as an address lookup (for 32 memory locations to start with, expandable later) and 8 bits as input for code or data values at these locations. The smart thing would be to use objects that identify themselves with a signal, using serial communication down a single wire with a standard protocol. The problem with this is that it would make potential ‘symbol objects’ themselves fairly complicated and costly – and I’d like to make it easy and cheap to make loads of them. For this reason I’m starting with a parallel approach where I can just solder across pins on a plug to form a simple 8 bit ID, and restrict the complexity to the reading hardware. 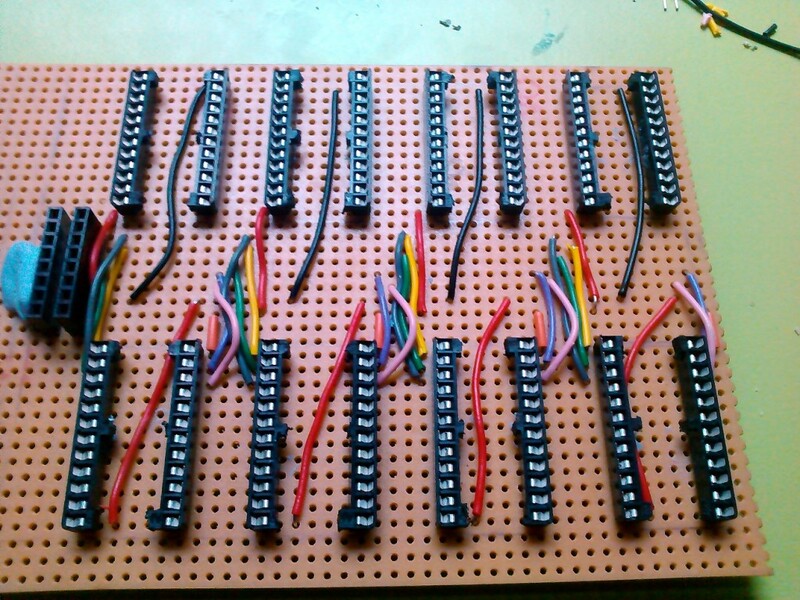 I’ve got hold of a bunch of 74HC4067 multiplexers which allow you to select one signal from 16 inputs (or the other way around), using 4 bits – and stacking them up, one for each 8 bits X 16 memory locations. This was the furthest I could go without surface mount ICs (well out of my wonky soldering abilities). 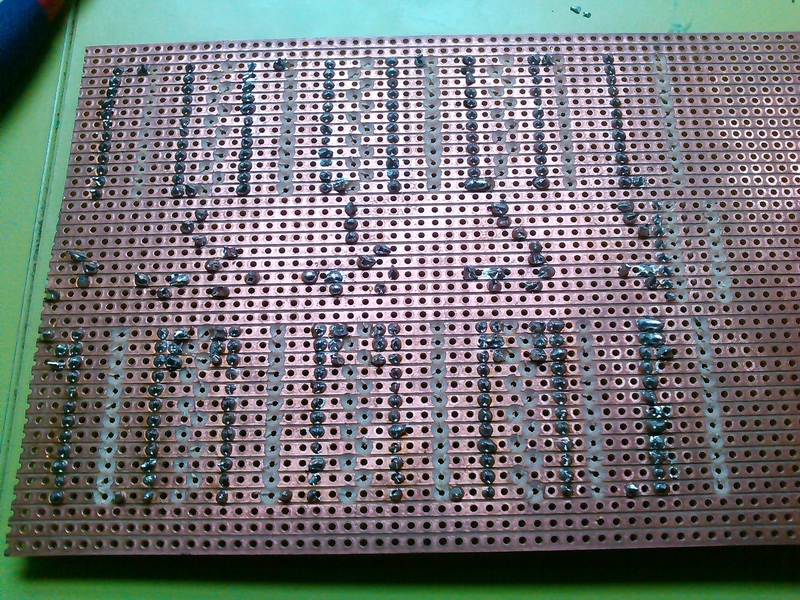 Building the board, (with narrow IC holders hacked by slicing them down the middle). The input comes in via a common bus down the centre of the board. 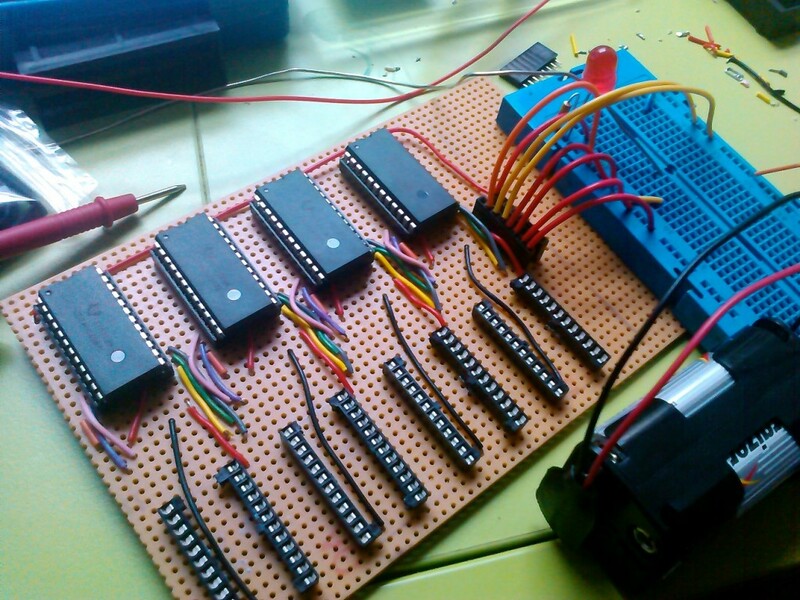 Now 4 bits are working it’s harder to test with an LED – so next up is getting the Raspberry Pi attached.